For the past sixteen years Mary and Denis Umstot have put over 60,000 nautical miles under the keel of TEKA III. Many articles about their travels were published by Passagemaker Magazine, from “Lure of the Bahamas,” to “Anxieties and Realities of Crossing the Atlantic,” to transiting the Panama Canal, as a few examples. Their Black Sea Rally adventure of 2004, with 36 other boats flying flags of eleven countries, became an article in the Turkish nautical magazine, Naviga, as well as Passagemaker. 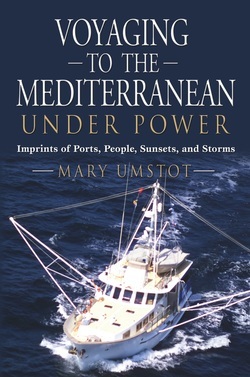 Now Mary has written a book, Voyaging to the Mediterranean Under Power: Imprints of Ports, People, Sunsets, and Storms. Imagine cruising the world in a 52-foot powerboat! During an eleven year voyage of 48,000 nautical miles, life on TEKA III meant crossing oceans and notorious river bars, riding out gales at anchor or on passage, barely missing a collision with a freighter, problem-solving mechanical issues with the engine or steering systems in lumpy seas, plowing through pyramidal confused seas or surfing large waves trying to board over the stern, offset by spectacular sunrises, sunsets, green flashes, starry nights, up close and personal encounters with wildlife, and visits to exotic ports of call along the way. Voyaging To The Mediterranean Under Power portrays this unique adventure from a woman’s perspective, to entertain, educate, and enlighten all travelers about a cruiser’s lifestyle on a long-distance powerboat.